Including how you can set yourself up for massive success by following the exact blueprint Bruce Lee used to go from unknown, to a world famous actor making millions of dollars and inspiring millions of people. 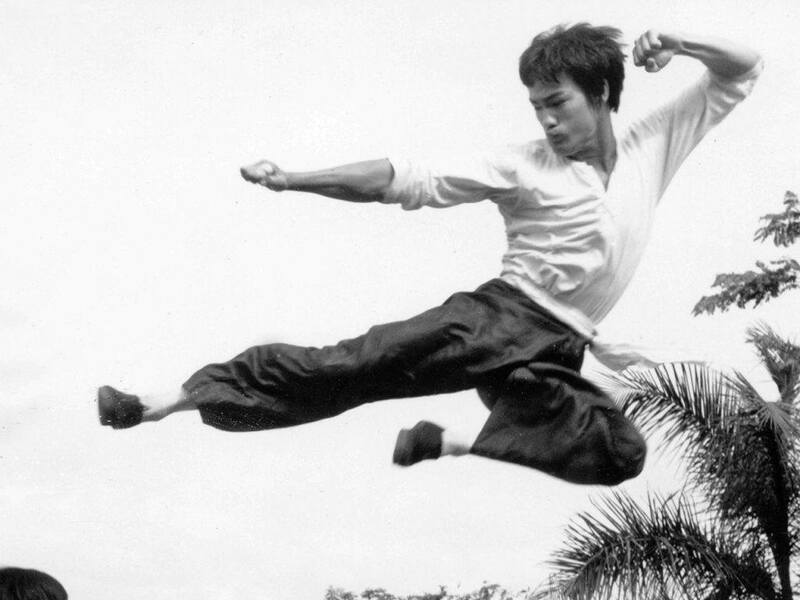 not be The Bruce Lee of your desired career path…. 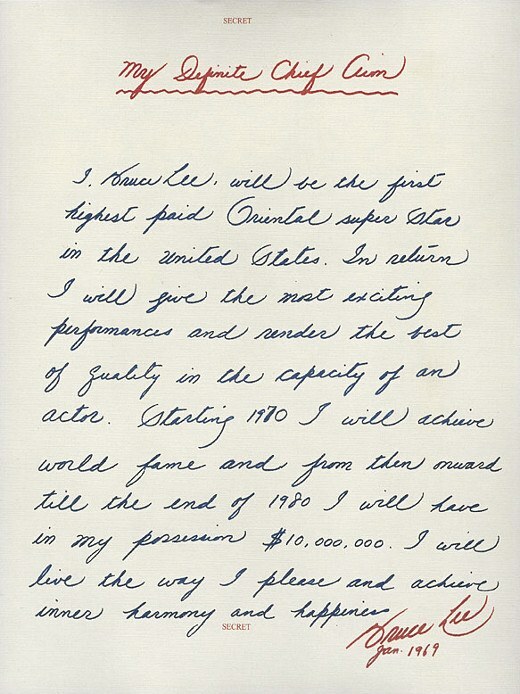 In January 1969 when Lee was 28 years old, and having minor success in the United States, he was not doing well financially. He had a wife and two children recently born. It was not where he wanted to be in terms of his career success and financial security. So what did he do…? He took out a piece of paper and wrote the following, which he kept in his wallet, took with him everywhere he went and read out loud every single day…. No…. This is not a joke…. This is literally what Bruce Lee did in order to take his career to the next level. The rest is history. 1.) He carried it with him everywhere he went. 2.) He worked everyday to move closer to the vision he’d put onto paper. 3.) He read it at least once a day. Everyday he was cementing the fantasy deeper into his subconscious mind of how he’d like his life to be. Cementing an idea into the subconscious mind is exactly how hypnotism works. We know from countless studies that a person can become hypnotized to “moo” like a cow, behave like a dog, and all kinds of other strange things. This is because the hypnotist accesses a person’s subconscious mind and they begin to behave unconsciously in the way the hypnotist suggests. This is exactly what happened when Bruce Lee wrote down his dreams and goals and read them everyday—he was cementing them into his unconscious mind, slowly but surely he hypnotized himself. Now I am going to explain to you why you will want to follow Bruce Lee’s example as soon as you finish this blog, and I am going to show you exactly how to do it. This is neuroscience and psychology. Psychologists tell us some 90% of our lives are unconscious. This means that basically you are on autopilot based off what’s in your subconscious mind. To help you understand how powerful it is to suggest your dreams to your subconscious mind through the process of writing out your Definite Chief Objective, just as Bruce Lee did, I’ll break down the respective functions of the subconscious and conscious mind. This is the part of you that thinks and reasons. Your free will lies here. This is the part of your mind that can accept or reject any idea. For example, if I tell you the sky has never been blue and it’s always red, you will reject that because you are consciously aware that’s untrue. No person or circumstance can cause you to think about thoughts or ideas you do not choose. The “thoughts” you choose consciously eventually determine what goes into your subconscious mind. As you accept a thought, it is impressed upon the second part of your personality, your subconscious mind. Now that you understand the basic functions of the conscious mind, I’ll explain the subconscious, or unconscious part of your mind briefly. Then we’ll send you on your way with your very own personal Chief Definite Aim, like Bruce Lee, so you can dominate your dreams, karate-kick fear, and judo-chop every challenge that stands between you and your desired lifestyle…. This part of you is certainly the most magnificent and mysterious. Every thought your conscious mind chooses to accept, this unconscious part must accept … it has no ability to reject. This is the part of the mind that hypnotists access when they get you to behave in unconscious ways. Any thought you consciously or unconsciously impress upon the subconscious over and over, becomes fixed in this part of your personality. Fixed ideas will then continue to express themselves without any conscious assistance, until they are replaced or overrode with another idea or image. (Fixed ideas are commonly referred to as habits and beliefs). It’s important to understand the subconscious and conscious minds, because then it begins to make sense as to why Bruce Lee wrote out his ambitions for life in a piece of paper and read it everyday. You maybe wondering, why did he do that again? Because the subconscious accepts and creates as your reality whatever is continuously impressed upon it. Just as a hypnotist commands your subconscious to bark like a dog, you can change the image of who you are and what’s possible for your life. By writing your DEFINITE CHIEF AIM you are telling your subconscious mind what to create instead of having it create at default of what your past has been. Now It’s Your Turn To Become Bruce Lee of Your Career Path And Master Your Wealth, Health, Happiness, and Love. 3.) Write out what comes to mind. Now that you’ve written out your aims for your life, you’ve begun to suggest it to your subconscious mind. Arnold Schwarzenegger says in his autobiography that one of the keys to his success was that he wrote out his dreams onto index cards and carried them around with him ever since he was just a young kid, all the way through his years as Governor of California. It’s hundreds of the greatest achievers of human potential ever. Now most of these people had no idea of exactly how they would make these dreams happen, they just knew they wanted it. So the question is what do you want…? Write it out on paper just how I’ve suggested and watch your life get even better than it already is. You can achieve good fortune, overcome fear, and become a force of nature. If you enjoyed this post, be sure to leave your email below to get these articles directly to your inbox. And don’t forget to leave a comment below of how it feels to make your own Chief Definite Aim. Good stuff, Jake. Profound but simple. Do you have any recommendations for those of us with health issues to help ourselves overcome these barriers? In a sense, losing my health was the start of knowing myself and what I want better, but now that I have started this self discovering process, I feel stymied related to putting in the work that is required to find a purposeful way back to financial independence. please excuse the delay, but do check out THE POWER OF THE SUBCONSCIOUS MIND by dr. joseph murphy on amazon. amazon book! Thanks Jake for this post. Ever since I’ve read The Secret – I believe in the power of thoughts and that they are the way to live the life you dream of. Even though I believe the power of words, I haven’t written down my clear goal yet. I have a vision board, but I think putting it in real words with hard numbers is the next level. Following great examples …and the one’s mentioned are truly inspiring… I will do this right now. I will write it down and keep this piece of paper with me, plus I will save it on my mobile, my tablet & my computer, so it’s always present… Let’s see how the future unfolds… I may keep you posted. PS: Funny how thoughts work – my goal for this year was to learn more about other REALLY successful people and there you are, having done most of the work already for me, all I have to do now, is reading your book. I’m really excited about it. Thanks for putting the effort into the research, structuring, writing the book and actually sharing it with the world. I heard about you on a RichRoll podcast – great interview! Nice! Thank you for the great reminder. High Five! try recording yourself on audio recording on an iPhone it’s great to get the juices flowing!!! Can you please tell me what your Mantra is please? It is really exciting to write out my chief definite aim. I feel that its powerful. I thank you, jake, because it was really generous of you to share this wisdom. I have learned that thoughts are the most powerful things on earth. You are a very exciting person to watch and I wish I could afford to meet with you. This wisdom made me feel like ive now met with you. Thank u. Awesome I knew this already but never really tried it fully thank you so much this is going to change my life and my families lives.